Parking revenue got you down? Here are 5 alternatives to try. Here are five alternatives to traditional pay-per-click domain parking. RootOrange – RootOrange will lease your domain name on a local basis to multiple parties. In theory, this leasing will provide you with a steady income stream that should top what you can achieve by using the domain at an international-only level. Check out DivorceLawyer.com for an example. Shopping Feeds – if you have a product domain, you should consider “developing” your domain by including products on the page. This will make it look like an e-commerce site. 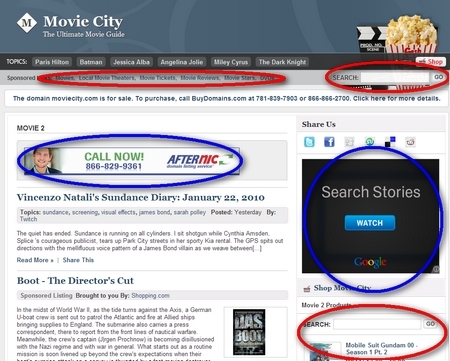 SmartName offers SmartName Shops, which uses a PPC feed from Shopping.com. You can also try Epik Product, which uses various affiliate feeds. Epik charges a set up fee, but offers a guarantee. Octane360 – Octane360 creates directory sites on your geo domain names (e.g. WashingtonAllergists.com) and then sells directory listings to local businesses via a call center. Sites can also be monetized using PPC and pay-per-lead. DevHub – DevHub offers a simple, WYSIWYG editor to create web sites quickly. You can drag-and-drop shopping product feeds, news, video widgets, and more. Monetization is primarily through PPC, but also includes affiliate and CPA options. WhyPark – now owned by domain parking company Parked.com, WhyPark quickly develops domain names using articles and other syndicated content. You can also add your own custom content for better results. Although this is traditionally recommended for domains that don’t get much traffic, WhyPark has been able to take good type-in domains and make more money than with traditional parking. NameMedia sells domain name from legacy domain parking service. NameMedia has been merging its domain parking platforms for a couple months, but a number of domain owners have yet to make necessary changes to their domains on the NameMedia platform. In particular, GoldKey and ActiveAudience accounts have been upgraded to SmartName. NameMedia sold the Goldkey.com domain name at the beginning of the year, meaning that domains parked on ns1.goldkey.com are no longer resolving, leaving money on the table for domainers. According to a name server report at DomainTools, there are currently over 25,000 domains pointing to GoldKey, so a lot of traffic isn’t resolving. Customers should login to their upgraded accounts at SmartName to check stats and update their name servers. Once you change your DNS to SmartName, customers should check out some of the new SmartName products such as the content system and SmartName Shops. NameMedia launches SEO-friendly content system and upgrades domain name parking accounts. Domain name parking company SmartName has launched a new content parking system, and has upgraded GoldKey and ActiveAudience accounts to take advantage of the new system. The new content system enables domain owners to create content-filled web sites on their domain names with the click of a few buttons. The content web sites pull in external news and blog feeds and create a web site automatically with the goal of receiving search engine traffic. The content system is monetized using search boxes and pay-per-click text ads. Users can also add their own banners and PPC ads, such as Google Adsense, and keep 100% of the revenue from those ads. SmartName representatives demoed the system to me last week, and showed me a number of sites developed on the content system that have PageRank and have achieved high rankings in Google, Yahoo, and Bing. The example below is fairly basic, but the system allows for extensive customization. The red circles represent SmartName’s monetization, which is shared with domain owners. The blue circles represent areas where the domain owner can add their own ad code and keep all revenue. There is one additional customizable spot near the bottom of the page. Using SmartName parent company NameMedia’s domain names, the content system has been shown to increase organic traffic 10x, increase page views per visitor 40%-75%, and boost revenue 10-25%. SmartName has also enhanced its E-commerce platform (also known as SmartName Shops), which allows customers to create a pay-per-click store on their domain names. An example I created (again, with no customization at all) is EverythingDogs.com. -High type-in traffic, product domain: try e-commerce template. Revenue per click may be a little lower but CTR should increase. It used to be extremely difficult to get an account at SmartName. However, users of GoldKey and ActiveAudience have had their accounts upgraded to SmartName in recent months as NameMedia consolidates its parking brands. If the content and e-commerce templates are not listed in a client’s account, they should contact their account manager for activation.